Kerry Kenny has been making music all of her life. 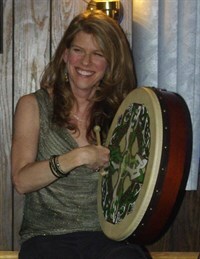 As a child, she grew up performing in her Grandparent’s Irish Pub outside Scranton, Pa. Eventually, her Aunt – a professional pianist – teamed young Kerry up with her siblings and cousin to form a traditional Irish music troupe. In high school and college, Kerry led bands, performed roles in community theatre, spent a year overseas in Ireland studying Irish Music, and eventually went on to pursue a graduate degree in music at NYU. Her second year of graduate school was spent at the Academy of Music in Krakow, Poland, where she studied Computer Music Composition under Professor/Composer Marek Chołoniewski. Kerry speaks fluent Polish and has taught English in South Korea. Her travels have taken her throughout Europe and parts of Asia. She’s composed music for animated film and collaborated with other artists on a stage musical in Poland (“Lans Macabre”). Kerry wrote the music for that project. While always teaching private music lessons, Kerry began teaching Music Together® after the birth of her first son in New York City 12 years ago. Both of her children are graduates of the Music Together program and can not only sing in tune but also play musical instruments proficiently. Kerry loves to teach and enjoys sharing her appreciation of all kinds of music with her students and families. She is thrilled to be bringing a program of such high quality and educational value to the Bloomsburg area!